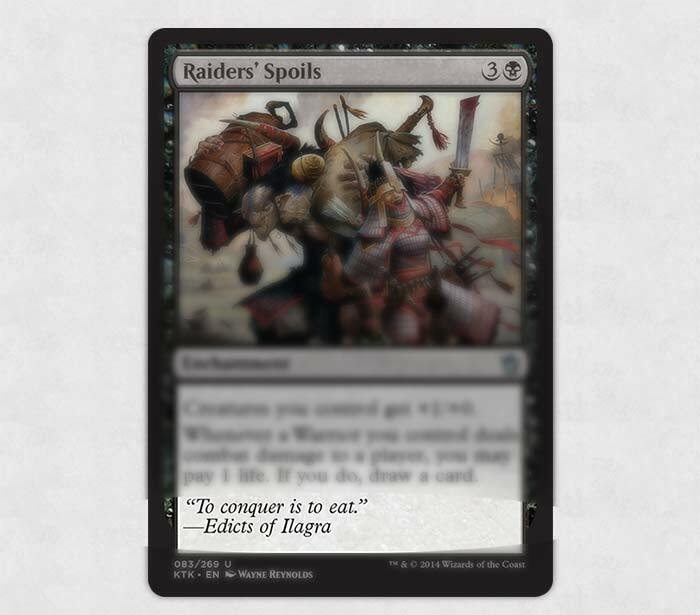 Raiders' Spoils, besides being a fantastic card to draft and build around, has some curious flavor text, less so for the quote itself, but for the attribution. "To conquer is to eat" certainly sounds like something the Mardu would say, so that part isn't terribly surprising, but what are these Edicts of Ilagra that are being quoted? It turns out, they're pretty important to the Mardu who, it may surprise you to know, have something of an honor code named after the first khan of the clan. Although not every member of Mardu society rides to war, every Mardu abides by this warrior's code called the Edicts of Ilagra. The Edicts, inscribed on a collection of dragon-hide scrolls, govern the rules of honor and combat for Mardu warriors. To conquer is to eat. As depicted on Raiders' Spoils, at the heart of the Mardu philosophy is the idea that a warrior earns by taking. They view the world through the lens of scarcity. There are more mouths than there are days of grain, so the one who fights best gets to eat. To rule is to bleed. On the other hand, the Mardu rarely rely on committing resources to a particular place. They spend little energy creating permanent infrastructure or integrating conquered peoples into their culture. It's common for Mardu armies to blaze across a territory, take a week's worth of grain, then move on without establishing any sort of settlement. Victory or death. When the Mardu go on the attack, they go full tilt. The archetypal image of a Mardu warrior is her riding into battle, leaning forward, standing up in the stirrups, sword out or bow at the ready—demonstrating great agility and riding mastery, but also demonstrating a willingness to sacrifice everything to hit hard and destroy the enemy. The Mardu leave nothing in reserve, preferring to die rather than fail.